The Bionic StableGrip is a contemporary glove that will take your golfing experience to a new level. It is very comfortable, and it comes with Tapered Fingers that also have 3D pads to ensure that you always get a comfortable and natural fit. 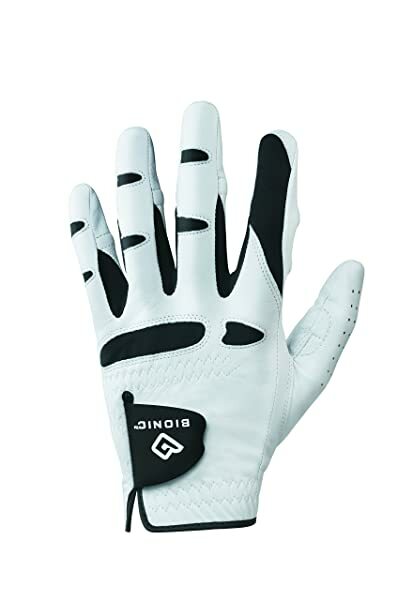 The Bionic StableGrip is a contemporary glove that will take your golfing experience to a new level. It is very comfortable, and it comes with Tapered Fingers that also have 3D pads to ensure that you always get a comfortable and natural fit. This fantastic glove also has an Anatomical Pad System, Lycra Gussets, Pre-Rotated Fingers and the amazing Web and Motion Zones that make sure that you maintain your natural dexterity and keep your hands dry. 3D Finger Pad: The 3D finger pads are among the most fantastic technologies on this glove because they help to stabilize a golfers grip by wrapping around the fingers. Anatomical Pad System: This Bionic StableGrip glove comes with some Anatomical Relief Pads, but their placement is what makes them unique because it helps to keep the hand surface even. An even hand surface ensures uniform distribution of pressure when gripping a club and this, in turn, prevents fatigue while also increasing the strength of the grip. Pre-Rotated Fingers: Bionic adopts the natural motions that you finger take when you fold them into a fist. This feature ensures that you always get a comfortable and effortless grip which is what you need for productive swings. Web and Motion Zones: The Lycra Web and Motion Zones in this glove ensure that you do not compromise your dexterity when you wear it. Also, the zones over the knuckles and between the fingers are of a lycra material that is breathable to ensure that your hand remains dry. Tapered Fingers: You will always get a natural and comfortable fit with this glove thanks to the tapered finger design. The 3D pads help to stabilize grip by wrapping around the fingers. It uses Pad Technology to increase durability and make the glove feel new every time you use it. You always get a natural fit thanks to the tapered fingers. Motion and Web Zones improve the feel and fit by minimizing bunching. Thick padding on the palm will protect your hand when swinging the clubs. Bionic gloves last up to three times longer than ordinary leather gloves. It feels and fits like a second skin. The design makes it breathable and hence will always keep your hands fresh and dry. The padding on the palm might feel too much and prevent you from holding the club well. It feels a little snug when you get it from the box. Some golfers find it a bit too pricey. It would be better if it would go up the wrist more than it does. This glove will not be suitable for using in wet conditions. Whereas some golfers will prefer to swing their clubs without gloves, most others will not go to the course without one. A best golf glove ensures that you always get an excellent grip and that your hand remains warm and dry. But to get all these benefits you have to go for one that uses modern technologies like this one from Bionic. It is a comfortable glove that feels and fits perfectly, and it also uses Web and Motion Zones for maximum breathability. Although most golfers that use it seem to love it, there are a few complaints about the price being high and other things like the fact that it is not suitable for wet conditions. 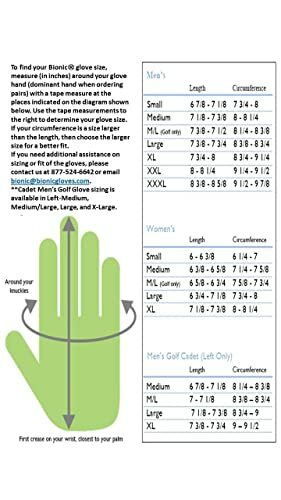 However, the bottom line is that it is an excellent golf glove and so it is worth buying.